If possible, it is best to take the child outside to explore and talk about leaves with them before beginning the art activity. Prepare for the lesson by taping the leaves to the paper. Create the edible paint by combining the cornstarch and food coloring with a few drops of water. Introduce the paint and paper to the infant and give them plenty of time to create. 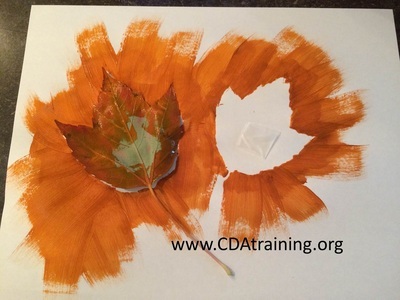 When they are finished, allow the paint to dry and carefully remove the leaf from the paper. A print of where the leaf was will be left behind. Hang the leave impressions around your classroom as décor. **This lesson can be adapted to practice fine-motor skills for infants that are ready to hold and control a paintbrush. Observe and record the student’s reaction to the paint. Make anecdotal notes and take pictures of the activity to share with parents.